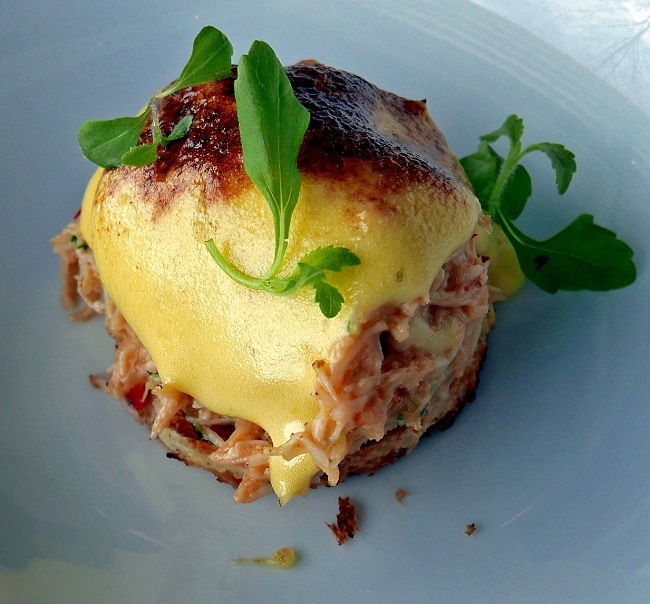 Homegirl London’s Restaurant Review: OXO Tower Restaurant. I was invited to review the iconic OXO Tower Restaurant for lunch and what a delightful time we had. With a thoughtful menu featuring beautiful British modern dishes, it was a real treat. Thanks to the South Bank location, the views across the Thames are spectacular. It’s a great eatery to book if you’re looking for places to eat on the South Bank or London restaurants for special occasions. The OXO Tower Restaurant is overseen by head chef Jeremy Bloor who has created a seasonal menu using quality British produce. Jeremy’s keen on the provenance of his ingredients so you can expect the best quality. I’ll talk about the lunch menu which we enjoyed. I ordered from the vegetarian and vegan menu which had a choice of six dishes. You can ask for any of those starter or main size which is helpful. I tried the Root Vegetable and Pearl Barley Risotto with Mushroom Emulsion and Chestnut Crumble. This looked very cute when it arrived and had a lovely light texture and more bite to it rather than being heavy and gooey. The sprinkling of crumble on top was slightly sweet as was the thin wafer style outer wrap which I enjoyed. Meanwhile, Homeboy was pleased to order a couple of fish dishes. His starter was Warm Spiced Dorset Crab on Toast with Honey and Lemongrass. He loved the subtle flavouring of lemongrass working its way through the crab and praised it highly. It was difficult for him to settle on a starter because the Lobster Tempura with Seashore Vegetable Broth and Smoked Salmon with Radish Salad were also strong contenders. I selected the Crown Prince Pumpkin and Isle of Wight Blue Cheese Tart with Almonds, Maple and Thyme, Organic Leaves for my main. This was a lovely tart full of flavour with a fresh side salad. I was debating whether I should try the King Edward Potato and Mushroom Cake with Poached Duck’s Egg and Beetroot Salad. The Goat’s Cheese, Pistachio, Honey and Fennel Crust, Beetroot, Ginger and Horseradish Cream dish also sounded wonderful. Homeboy ordered the Turbot, Caramelised Endive, Crispy Kale and Orange Emulsion. This was just the right portion size and perfectly cooked. The flavours worked well together and he particularly enjoyed the dabs of orange emulsion. We also ordered a side of chips and tenderstem broccoli with toasted almonds and brown butter. Other fish mains included Stone Bass with Razor Clams in a Champagne Sauce, Dover Sole Fillet with Crisp Oyster and Hand-dived Scottish Scallops. Meat wise it’s Free-range Port Cutlet, Dry-aged Beef Fillet or Loin of Lamb. We shared two desserts which were the Caramelised Apples and Chox Buns with Crème Fraiche. The Chox Buns were so cute and yummy. We also went for the Blood Orange and Poppy Seed Syrup Cake with Almond Ice Cream which was also delectable. Other desserts included the OXO Organic Chocolate Plate with a selection of rich chocolate offerings which was tempting but we were just too full. The Rhubarb and Custard with Hendricks Gin Sorbet and Lemon Hazelnut Tart also sounded great. Otherwise you could try the cheeseboard of Neal’s Yard British and Irish Farmhouse varieties. In terms of prices, starters are £11-20 while mains are £20-60 and the vegetarian / vegan options are slightly cheaper. From Monday to Saturday 12pm until 2.30pm and on Sunday 12pm until 3pm you can choose from a set menu for £35 from three starters, mains and desserts. The drinks list is extensive. As it was lunch time we ordered a few non-alcoholic cocktails which were fabulous. We can recommend the Cinnamon Banana Colada and Seeds of Change plus the Oriental Chill. If you want an alcoholic cocktail, try one of the Martini varieties which this establishment is famous for. In terms of wine, there is an impressive offering with many by the glass which is brilliant for a lunch time tipple. Of course, they have Champagne and Prosecco so you can raise a glass … or two! We dined in the Restaurant but just so you are aware, there is also the Brasserie and Bar (serving snacks) which are all located on the eighth floor. On the street level, you will see directions to the elevators, take a lift to floor eight and on one side you have the Restaurant and the other is the Brasserie. This eatery is famous for the balcony terrace overlooking the Thames River with breathtaking views. If the weather isn’t behaving itself, you can still admire the scenery thanks to the floor to ceiling glass window. The interiors are simple and elegant. Look up to see the blue ceiling which at night sparkles with blue neon lights to give a moonlit effect. The tables are dressed with crisp white cloths and the leather clad dining chairs are rather comfy. Otherwise it is very minimal because when you have the backdrop of London, you don’t really need anything else to distract from that! The restaurant is owned by Harvey Nichols & Co Ltd, to find out more go to the OXO Tower Restaurant section on their website. The address is OXO Tower Wharf, Bargehouse Street, South Bank, London SE1 9PH. Go up to floor eight to find the Restaurant, Brasserie and Bar. Blackfriars, Southwark, Waterloo and London Waterloo East stations are close by and then you have a short walk. Because they serve lunch, afternoon tea and dinner, the opening times should be checked on the website before you book. Author: Homegirl London. Photographs: Homegirl London and Harvey Nichols & Co Ltd (the interiors image). Thanks: Julie Carolan for booking the meal, information and photography. Disclosure: Our lunch was paid for by Harvey Nichols & Co Ltd, thanks very much. Also thanks to my Homeboy for joining me.